I had the pleasure last Friday of attending a Continuing Professional Development networking event held by Society of British and International Design, in the HQ of London’s eponymous interior and architecture firm, 1508. The first of their events that I’ve attended, I was suitably impressed with its’ orchestration and stimulated by the general atmosphere throughout the evening. The room was brimming with a mix of industry associates, from architects to lighting designers and interior design photographers. I mingled and met a selection of valuable and inspiring individuals, sharing our contrasting industry stories and even hints of professional advice, all the while sipping Prosecco and indulging in canapés. A hush filled the room as we were greeted with warmth and a dash of humour by Vanessa Brady, President & Founder of SBID. She encouraged the exchange of business cards with a top up of the bubbly and introduced the talk of the evening. Top of the agenda was a presentation by Peter Harrison, chairman of Harrison Goldman – top stone consultants and design engineers. Peter highlighted various factors to consider when researching and purchasing stone products. He covered the association of a stones’ thickness with its’ use as well as the affects of climate on a particular type of stone, to name but a few. Arguably, the most important part of his presentation was the emphasis on government regulations for identifying and using stone products in the UK. He spoke of the importance of knowing these regulations and the risks surrounding liability as the Designer or Architect. He made us aware of particular ‘watch-outs’, such as purchasing a product from outside the EU and the safety risks of misusing a material. His wealth of knowledge proved insightful to me, and no doubt many others in attendance. As applauds concluded the talks and the mingling continued, I had the pleasure of meeting Nicoletta from Society of British Interior Design. Our conversation reminded me of the approachability and ongoing support offered by SBID as an organisation. I left feeling elated and anticipating the next CPD event for another indulgence of networking, industry learning and inspiration. 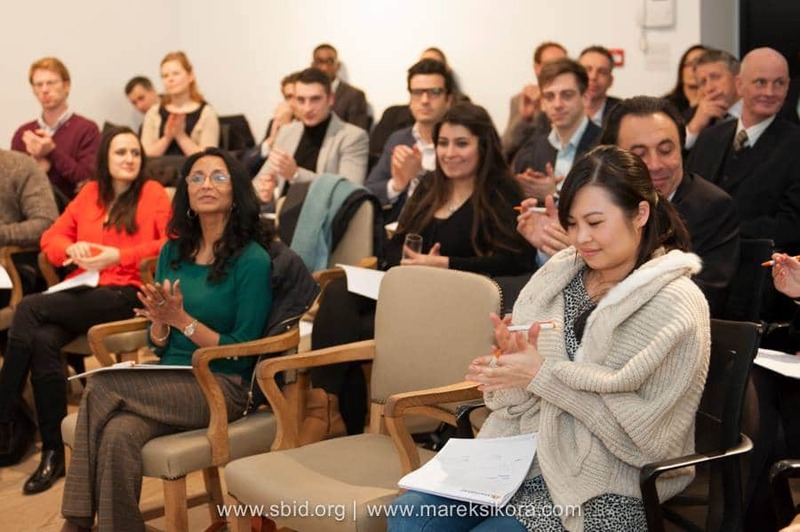 For more information on the SBID CPD Programme, please go to sbid-cpd.com or visit the SBID Youtube channel to watch the full CPD presentation. Author: Shanna Rogan, emerging Interior Designer and founder of interior-imagination.